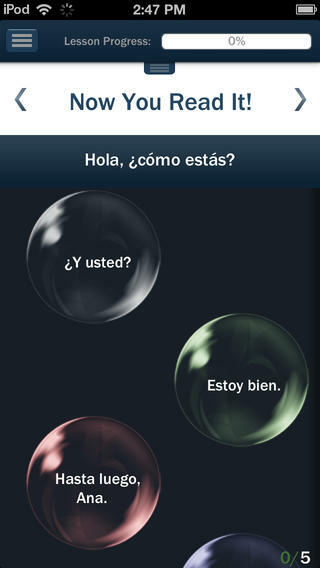 If you fancy yourself to be the ultimate polyglot or traveller, this app is for you. 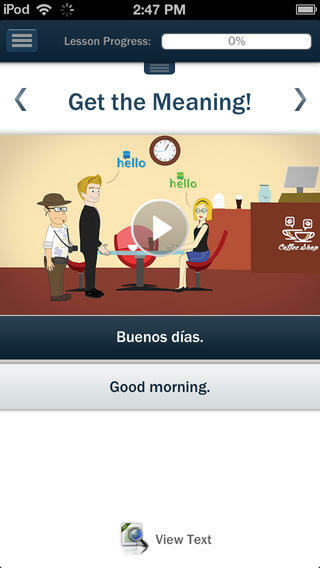 You can learn up to 13 languages to conversational standard. The method is easy and fun. We have given the app an EAS Certification of 5 Stars. 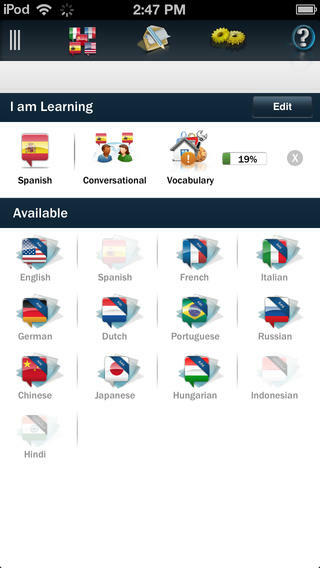 You can purchase each language as a separate app however, for pretty much the same price, you can buy a license for the Hello-Hello Complete app and get all courses, in all 13 languages and be able to access it in any device (iPad, iPhone, Android Tablet and Smartphones and on a Desktop) so it is a much better deal. They offer English, Spanish, French, Italian, German, Dutch, Portuguese, Hungarian/Magyar, Chinese, Japanese, Russian, Indonesian and Hindi. 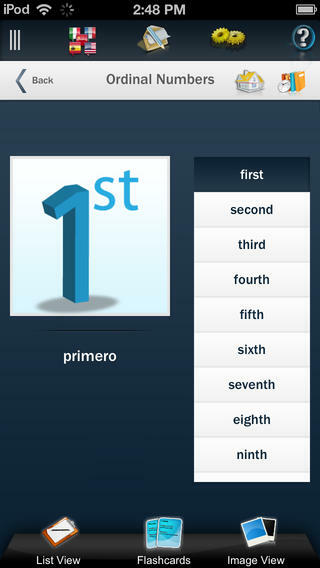 The app is great for starting at a basic level and building your way up in the language. The teaching method is very simple and is based on the idea that learning in a variety of different ways and via repetition in order to hone the vocabulary and basic conversation pieces. The app does not contain grammar or verbs, so the learner must be aiming for a high basic to low intermediate level in the language. For those Teachers who would like to use the app in the classroom or recommend it to their students, there are a few things that need to be taken into account. They have a great analytics platform where teachers can see the progress for each individual student and they also offer special prices for schools.T​hey have the only app with lessons developed in collaboration with The American Council on the Teaching of Foreign Languages (ACTFL), which assures the quality of the content. . The teaching features are great as a teaching tool for the classroom. You can go through each topic with the class and use it as a lesson plan for additional practice inside or outside the classroom. Additionally, you can play the videos to the classroom and stop them to reinforce certain words, sayings or concepts. The app works wonderfully as a testing tool as it offers immediate feedback on whether you are right/wrong and the answer to the question. We also liked the “push notification” system which offers students a “word of the day” in order to remind them of vocabulary. A lot of language is repetition and committing to memory therefore is add-on helps in reinforcing that idea to students. We also really liked the fact that students can make notes within the app so that they can personalise their own learning process. Overall this is a very nice and comprehensive app. It is entertaining, educational and effective. ATTENTION: Hello-Hello Languages is a free download exclusively to Hello-Hello subscribers to access the content from their mobile devices. Only Hello-Hello subscribers have access to our courses from this app. Conversational Course: 30 conversational lessons based on real-life situations that will enable you to start communicating effectively from Lesson 1! Basic Course: More then 1,000 vocabulary words with exercises to practice all skills you need: Read, Write, Speak, Listen! Access to both courses in 13 Languages: Spanish, English, French, Italian, German, Dutch, Portuguese, Hungarian, Chinese, Japanese, Russian, Indonesian and Hindi. Access to your courses from any mobile device and from the Web! CONVENIENT: learn from your mobile device anytime, anywhere. EFFECTIVE: research-based innovative mobile immersion methodology that develops all skills you need at your own pace. RELEVANT: learn to communicate about real world topics. FUN: animated videos and interactive exercises. Hello-Hello’s innovative Mobile ImmersionTM methodology engages and encourages learners of all ages to acquire usable language skills quickly! Mobile ImmersionTM creates a unique VIRTUAL environment that GUIDES the learner VISUALLY to develop FUNCTIONAL language skills. VIRTUAL: Creates real-world animated situations in the new language. 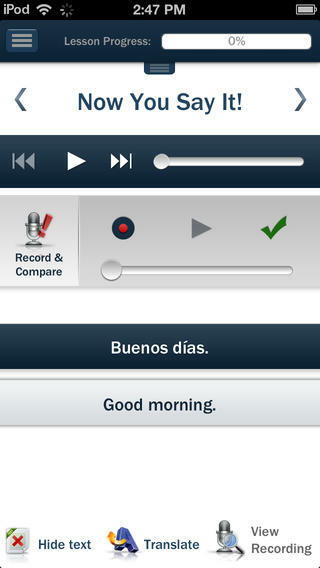 GUIDED: Builds new vocabulary and phrases to develop language skills. FUNCTIONAL: Develops the foundation for learners to put their new language skills to use in the real-world fast. WORKS IN ALL DEVICES: Access the course from any mobile device & on the Web. RESEARCH-BASED METHODOLOGY: Developed in collaboration with ACTFL - The American Council on the Teaching of Foreign Languages, which is the largest and most respected association for language teachers and professionals. ACTFL's proficiency guidelines are followed by all major schools and universities in the U.S. LEARN TO COMMUNICATE: Learn to communicate effectively from LESSON 1! Hello-Hello offers 30 conversational lessons based on real-life situations rather then a collection of out-of-context words and phrases. INTERACTIVE ANIMATIONS AND COMIC STRIPS: Beautiful, fun animated lessons! Meet Paul, Mark and Ann! Follow them on a trip and have fun learning! PRACTICE ALL SKILLS: Games and exercises to practice Speaking, Writing, Reading and Listening skills! VOCABULARY BUILDING: Practice vocabulary with our innovative “Build Your Vocabulary” exercise where you can practice vocabulary in the context of a dialogue. Receive “WORD OF THE DAY” notifications to help you memorizing throughout the day. Practice individual words with our Basic Course featuring 7 different modules for learning. NOTES: Save your own notes from within the lessons to review later! LESSON REMINDERS: Don't worry about remembering to study. We will do that for you! TRACK YOUR PROGRESS: Track your lesson and course progress. USER-FRIENDLY INTERFACE: Intuitive interface with beautifully designed graphics.